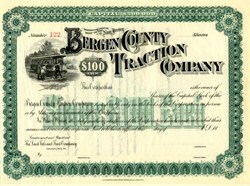 Beautifully engraved RARE unissued certificate from Bergen County Traction Company printed in the 1890's. 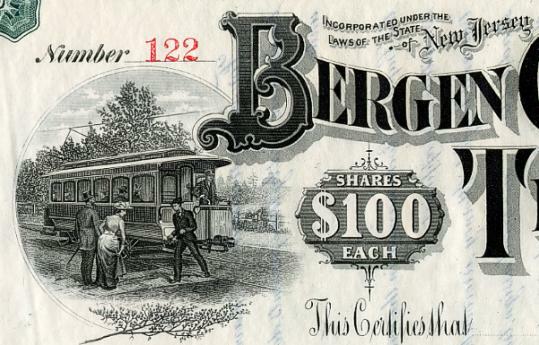 This historic document was printed by the E. A. Wright Banknote Company and has an ornate border around it with a vignette of an electric trolley. This item is over 117 years old. This is the first time we have seen this certificate for sale. The Park on the Palisades opened in 1898 as a trolley park, a weekend destination planted by the Bergen County Traction Company, a trolley operator that provided service between the Edgewater ferry landing and the top of the Palisades. In this original incarnation, the park had few characteristics of an amusement park. Nonetheless, patrons utilized the trolley line to reach the passive recreation site atop the hill.